And this celebrity matriarch sees lots of money to be made with that combination. It was originally just supposed to be a tax shelter, but now she realizes it could be a revenue generator. She is fascinated by [Competitor Church], which she sees as a model for what she wants to do. That’s why [her daughter] goes to [Competitor Church], to get the inside scoop on how everything works. The long-term plan is to rebrand their own church to something catchy, expand the reach, and get attention by doing something outrageous or news-worthy at the service every week. Each stunt will be publicized via photo ops and video clips. It doesn’t matter if you love it or hate it, as long as it gets attention. Then they can grow the number of members, maybe even do a weekly broadcast so they can grow the church worldwide, and watch the “donations” roll in. What? You mean the family’s religious machinations aren’t actually about religion or about keeping a strong moral core? They’re about money and publicity and a possible TV show? Shocking! We’ve been telling you all along: Everything they do is a calculated business move. Everything. I about fell out when Kimye posted her ‘morning psoriasis’ pictures before going to “her family’s Sunday Service”. What? Her family’s Sunday Service? They have their own services? 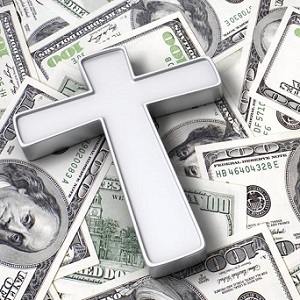 The Church of the Almighty Dollar? Oh, and Kortney is the spy. How sad. How very, very sad. They really out here tryna compete with a Church?! How about “Don’t play with God heathen, or you’ll burn for eternity in hell” as a name for their church! Know this all the Mega Church are the same.. I don’t care what’s their religion..
or Church of Yeezy and the Latter Day Soul-Suckers. Kris Jenner isn’t going to hell fast enough with this antic. Kanye “ Rev” West educating the masses boggles the mind! And last but not least, Kim attending church in her plastic pants looking like she fell off the stripper pole and and got mercy tip money. These people are soulless oxygen thieves! This has to be Kris Jenner. That actually sounds like something they would name it. I’m assuming they are calling it the Church of Yezus Christ. Don’t give them any ideas, nothing is beneath that family, including blasphemy. This just screams Kardashian to me. Just when you think they can’t get any lower…. Kris Kardashian is just unbelievable vile, even if this blind isn’t about her. We’ll see you in prison K family. You’ve gone too far. No, satan will see them in hell! Who but the Kardashians would even consider using God for fortune and fame……that family is truly disgusting! Who but the Kardashians? How about the Catholic “Church” — or, when you get right down to it, most organized religions. I have no love for the K family, but it’s disingenuous to suggest that most (I won’t say any) don’t exploit their God for money and power. Optional: Church of Grifting. At least it’s transparent. Kris * and the rest of the PIGS….NO MORALS or CLASS…. Do we need any other sign that the world is ending than the Kardashians having their own “church”? The other cult is Hillsong. No idea of the church…..
Kanye and his Yeezus Church drivel. All of these kooks need to just go away. Chris Jenner is an ordained minister. It is Mama Kardashian. No one in that family has a core, let alone morals. The * and the daughter that goes to the church in Miami related to the weird Hillsong church. Kanye and the Kardashians are starting a church??? What the absolute ————!!!! New name…You heard of Church of the Open Door? Well, there’s is Church of the Open Wallet…in this case, its YOURS! With the Right Reverend, ‘Lord’ Scott Disick. ..Let the Lord guide your hands..and hand over that credit card..TODAY!!! Absolutely deplorable. The kardashians and Hillsong scam of course. The Kardashians started the Life Change Community Church. No, better name would be: Church of the CelebuGreeds. Hill song Church – Kourtney goes there. Must be the * so my church name for them would be *. [Optional] Contest: Suggest a new name for their church! * for Jesus? * House of Money? Or else: Kash for Khrist Kongregarional Khurch.